By Scott Gilfoid: Former two-time middleweight world title challenger Gabriel Rosado is a name being mentioned as the next opponent for Kell Brook for his tune-up fight this summer. According to Boxingtalk.com, the 32-year-old Rosado (24-11, 14 KOs) is a possibility for the former IBF welterweight champion Brook (37-2, 26 KOs) to be facing in a fight that would take place in the 154lb weight class. It’ll be tough on Rosado to get down to 154, as he hasn’t fought in the junior middleweight division in four years since his controversial 10 round unanimous decision loss to Jermell Charlo in January 2014. Rosado started his career out at 154 in 2006 and fought in the weight class until challenging IBO/WBA middleweight champion Gennady Golovkin in January 2013. Rosado stayed at middleweight after losing to Golovkin. However, Rosado probably would have done better had he remained at 154, as he’s struggled at middleweight in losing to David Lemieux and Peter Quillin by knockout and losing to Willie Monroe Jr. and Martin Murray. 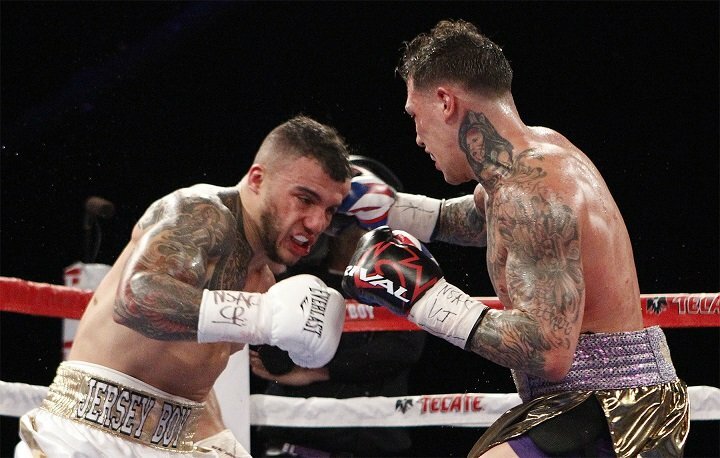 Rosado’s 12 round majority decision loss to Murray last year in April was a controversial one, as many boxing fans felt that Rosado deserved the victory. The fight took place in Murray’s hometown at the Echo Arena in Liverpool, England. Boxing News 24 had Rosado winning 8 rounds to 4. Rosado obviously didn’t realize what he was up against in going to Murray’s hometown to fight him. If he did, he likely would have emptied out his gas tanking shooting for an early knockout so the fight wouldn’t go to the scorecards. This is arguably a slight step up for Brook from his last fight against Sergey Rabchenko last March. Hearn said he was going to have Brook step up in his next fight in July. Rosado is clearly a step up from Rabchenko, but the fact that Rosado will need to come down in weight to 154, it puts him at a huge disadvantage right off the bad. If Rosado was in his early 20s, then it wouldn’t be such an issue for him to drain down to 154. Unfortunately, Rosado is 32-years-old and it’s not going to be easy for him to lose that weight at his age without being weakened, which is probably the whole point of the fight. Rosado is just a name to help make Brook look better in the eyes of boxing fans. If Brook can add Rosado’s scalp to his resume, the casual boxing fans won’t bother to look closely at the details of the fight to discover that Rosado had to come down six pounds to face Brook at 154. Personally, I’d like to see Brook show some class if he faces Rosado by agreeing to meet him halfway at a catch-weight of 157 pounds, so that the fight is somewhat fairer. What we don’t want to see is completely drained Rosado inside the ring on the night, too weak to throw punches and looking like he needs to be home in bed rather than fighting. It’s expected that earn isn’t going to put Brook in with any of the good junior middleweights before he matches him against Amir Khan in a huge payday match in the UK in either late 2018 or in 2019. There’s too much money for Brook to make fighting Khan for it to be thrown away. Brook has been called out by the 154lb champions Jarrett Hurd and Jermell Charlo. They both have let Brook know that he can get a title shot whenever he wants without having to wait in a lengthy line like other 154lb contenders. Hearn missed out getting Brook an easy world title by failing to match him against WBO junior middleweight champion Sadam Ali. I’m not sure what the deal was with that, but it was a missed opportunity for Brook. He would have likely destroyed Sadam Ali and won his World Boxing Organizaton junior middleweight title. At least Brook would have the WBO strap now rather than being just a contender. In looking at the possible reasons why Hearn didn’t make that move is perhaps he didn’t want to create pressure on Brook and risk him getting thrashed before he got the cash-out against Khan. I mean, if Brook had beaten Sadam to win the WBO strap, he would now be looking to have to defend against Liam Smith right away in his first title defense. Smith isn’t a great junior middleweight obviously, but he’s tough enough to potentially beat Brook, who is kind of brittle and has stamina issues. It wouldn’t be an easy fight, or a slam dunk guaranteed victory for Brook like many of the fights that Hearn has put him in since he started promoting him. Since Hearn took over as Brook’s promoter, he’s had exactly three tough fights against Shawn Porter, Gennady Golovkin and Errol Spence Jr. Brook lost all three of them in my opinion. Brook was stopped by Golovkin and Spence, and his over Porter was a controversial 12 round majority decision in August 2014. Brook fought the entire fight holding Porter to prevent him from throwing punches. Brook’s other fights have come against the likes of Rabchenko, Kevin Bizier, Alvaro Robles, Jo Jo Dan, Matthew Hatton, Hector Saldivia, Vyacheslav Senchenko, Frankie Gavin and Carson Jones. There’s no quality there. Rosado has lost two out of his last three fights since 2016. As I was saying, you can’t count Rosado’s fight against Murray as a loss, because he deserved the victory, but even if he had beaten him, it’s not a great victory. Murray is a more of a high-level journeyman at this point than a true contender. He keeps getting world title shots over arguably far more deserving fighters, because he’s seen as a safe fight. Murray is also well-connected with his promoters. Could Brook beat some of them? Absolutely, I think Brook could possibly beat three or four of the names from this list, but I also think he potentially lose to all of them as well. The fact that Brook can’t be guaranteed to beat even the majority of those guys shows you how flawed he is at 154. If Brook were fighting at 147, he would be a top five guy and be counted on to easily defeat the other contenders in the division. I don’t see Brook as being the same guy fighting at junior middleweight. As such, Hearn is going to need to be careful with Brook until after he gets his cash-out fight against Khan. Once Brook has made his money, then Hearn can match him with Hurd or Charlo and we’ll see what his destiny is. My guess is Brook will be knocked out by Hurd and Charlo, and then wind up saying he’s got to move back down to 147. I also think Brook might retire after the loss unless Hearn can throw some money at him to use him for his DAZN platform. I think that’s what’ll happen. Hearn keep Brook fighting even if he has no real place to go to win a world title at 154. Hearn can use him as a guy that he puts in against middle of the road opposition. Brook vs. Rosado could be part of Matchroom Boxing USA promoter Eddie Hearn’s new deal with DAZN. It gives Hearn a fight that he can use to try and entice fans to subscribe to the platform to see the fight. It’s more of a fight that will attract boxing fans in the UK though than the U.S.